After a thoroughly enjoyable 58th staging in Malmo, the Eurovision Song Contest didn’t have far to travel for the 2014 final. Just a hop, skip and a jump across the Oresund, Europe’s most melodic gathered in Copenhagen for the main event and the Danes certainly didn’t disappoint. Conchita Wurst may have claimed glory for Austria but the contest provided Denmark with a unique opportunity to shine and by heck, they did. 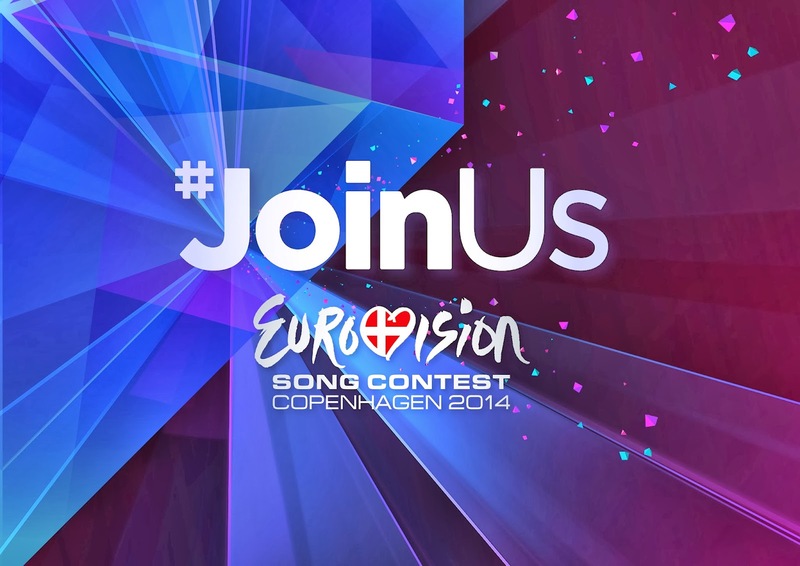 From the very beginning it was clear that the host nation were determined to make this year’s contest a memorable and inclusive one, inviting fans from across the world to become part of the show. The fruits of their labour were rather enjoyable too: Emmelie De Forest was accompanied by a classy interactive choir during the first Semi Final, while an utterly adorable young Irish lady stole hearts in a rather special dance off during Semi Final 2. And as if that wasn’t enough, the atmosphere in B&W Hallern was utterly electric: Even those of us watching at home could, to quote one Darius Danesh, feel the love in the room. If there’s one thing that’s guaranteed to drive a Eurovision fan up the walls it’s an annoying presenter and, generally, the contest tends to provide plenty of them. The Danes, however, cracked out the last person anyone expected to see and it definitely paid off. Seasoned TV hosts Nikolaj Koppel and Lise did a wonderful job but they quite simply couldn’t keep up with the utterly charming Pilou Asbæk, better known as the notorious Kasper Juul from smash hit political drama Borgen. He worked wonderfully with his co-hosts to bring wit and humour to the proceedings and his short films about Copenhagen and the history of the Eurovision were a big hit. Anyone who can make my cynical Eurovision-wary boyfriend chuckle heartily deserves a medal. Asbæk and Koppel kept their Twitter followers up to date on what was going on in the arena and backstage. #JoinUs wasn’t just a hashtag – it was definitely an invitation that they were only too happy to extend. And of course, they even took the absolute mickey out of themselves by recording a wonderfully bizarre 12 Points song. 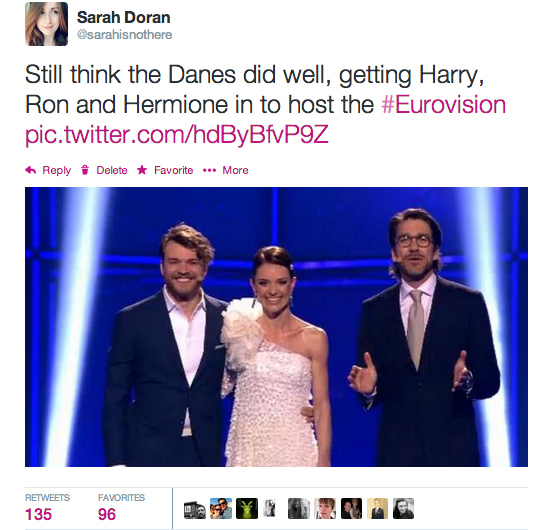 The Danes kept the #JoinUs theme going by taking the show to one of its most amusing commentators; Graham Norton. We could have been bored to tears by an extended interval act but instead, viewers (in the UK and Ireland at least) were treated to the wonderful sight of Pilou and Nikolaj calling our Graham out on his catty/wonderful commentary and releasing a deluge of confetti upon him. It was a simple but B-E-A-Utiful play by the producers. Nobody cared whether it was rehearsed or not. Douze points were awarded for effort and entertainment value. Speaking of the interval act, Emmelie De Forest was on hand to lead all 26 finalists in a rendition of the specially penned track Rainmaker. Dubbed Denmark’s Waka Waka, the tune filled the B&W Hallern with a real sense of celebration, reminding the world and its wife that the song contest was all about the people it brought together. It was difficult NOT to sway along and wish you were there, especially when Johnny Logan flashed up on screen (at around 4 mins 53 seconds, if you’re interested. Of course, the real highlight of the evening was Conchita Wurst’s victory. The hosts, audience and delegates from countries across the world were only too delighted to deliver point after point to the Austrian Queen of Eurovision. And when she won, she made her own unforgettable contribution. The stage is now set for an exciting 60th birthday celebration for the Song Contest in the spiritual home of The Sound of Music. There’s no doubt that the hills will be alive, but can they outdo Copenhagen? Guess we’ll have to wait 12 months to find out. Sure what’s another year, eh?